“Education is the civil rights issue of this century. Equal access to public education has been gained. But what is the value of access to a failing school? We need to shake up failed school bureaucracies with competition, empower parents with choice, remove barriers to qualified instructors, attract and reward good teachers, and help bad teachers find another line of work. School Choice: The issue of school choice has proven a cornerstone of McCain’s educational strategy. McCain says that he and his wife decided to send their children to parochial school, and now he wants to ensure that all parents can have the same freedom. Encourage Alternative Certification Methods That Open The Door For Highly Motivated Teachers To Enter The Field. 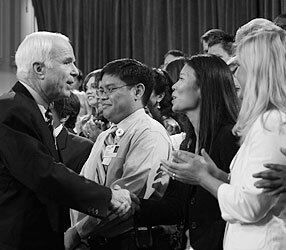 McCain will devote five percent of Title II funding to states to recruit teachers who graduate in the top 25 percent of their class or who participate in an alternative teacher recruitment program such as Teach for America, the New York City Teaching Fellowship Program, the New Teacher Project, or excellent university initiatives. Provide Bonuses For Teachers Who Locate In Underperforming Schools And Demonstrate Strong Leadership As Measured By Student Improvement. McCain will devote 60 percent of Title II funding for incentive bonuses for high performing teachers to locate in the most challenging educational settings, for teachers to teach subjects like math and science, and for teachers who demonstrate student improvement. Payments will be made directly to teachers. Funds should also be devoted to provide performance bonuses to teachers who raise student achievement and enhance the school-wide learning environment. Principals may also consider other issues in addition to test scores such as peer evaluations, student subgroup improvements, or being removed from the state’s “in need of improvement” list. Provide Funding For Needed Professional Teacher Development. Where federal funds are involved, teacher development money should be used to enhance the ability of teachers to perform in today’s technology driven environment. We need to provide teachers with high quality professional development opportunities with a primary focus on instructional strategies that address the academic needs of their students. The first 35 percent of Title II funding would be directed to the school level so principals and teachers could focus these resources on the specific needs of their schools. The D.C. Opportunity Scholarship Program: The Opportunity Scholarship program serves more than 1,900 students from families with an average income of $23,000 a year. More than 7,000 more families have applied for that program. The budget for the Opportunity Scholarships is currently $13 million. John McCain believes that this extremely successful program should expand to at least $20 million benefiting nearly a thousand more families. High Quality Tutoring Programs: Local school districts can certify education service providers but providers can also bypass the local bureaucracy and receive direct federal certification. Education service providers can then market directly to parents. Title I money will be directed straight to the provider. Expanding Virtual Learning: By Reforming The “Enhancing Education Through Technology Program.” John McCain will target $500 million in current federal funds to build new virtual schools and support the development of online course offerings for students. These courses may be for regular coursework, for enhancement, or for dual enrollment into college. John McCain Will Allocate $250 Million Through A Competitive Grant Program To Support States That Commit To Expanding Online Education Opportunities. States can use these funds to build virtual math and science academies to help expand the availability of AP Math, Science, and Computer Sciences courses, online tutoring support for students in traditional schools, and foreign language courses. John McCain Will Offer $250 Million For Digital Passport Scholarships To Help Students Pay For Online Tutors Or Enroll In Virtual Schools. Low-income students will be eligible to receive up to $4,000 to enroll in an online course, SAT/ACT prep course, credit recovery or tutoring services offered by a virtual provider. Providers could range from other public schools, virtual charter schools, home school parents utilizing virtual schooling resources or district or state sponsored virtual schools. The Department of Education would competitively award the funds to a national scholarship administrator who would manage the student applications, monitoring, and evaluation of providers. Source: http://www.johnmccain.com/Informing/ issues/19ce50b5-daa8-4795-b92d-92bd0d985bca.htm ““Just as with energy independence and health care, the urgency of upgrading public education for the 21st century has been talked to death in Washington, but not much has gotten done. And that failure to act has put our nation in jeopardy. I believe the day of reckoning is here. Our — our children and our country can’t afford four more years of neglect and indifference. No Child Left Behind: Obama has repeatedly criticized the 2002 legislation, adopting the slogan: Left the Money Behind and Left the Students Behind. While Obama praises NCLB’s emphasis on accountability, he argues that the law was an unfunded mandate – inadequately implemented by the Education Department. Obama has pledged to reform the law – beginning with additional funding. He will also improve the assessments used to track student progress and improve NCLB’s accountability system so that we are supporting schools that need improvement, rather than punishing them. Zero to Five Plan: Obama’s “Zero to Five” plan will provide critical support to young children and their parents – placing key emphasis on early care and education for infants. Obama will create Early Learning Challenge Grants to promote state “zero to five” efforts and help states move toward voluntary, universal pre-school. In addition, Obama will expand early Head Start, increase Head Start funding, and improve quality for both. Finally, he pledges to provide affordable, high-quality child care for working families. 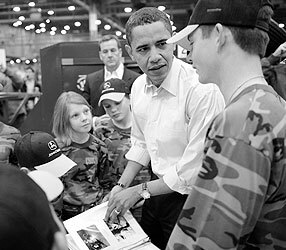 Math and Science Education: Obama plans to make math and science education a national priority. He pledges to recruit math and science degree graduates to the teaching profession and support efforts to help these teachers learn from professionals in the field. He will also work to ensure that all children have access to a strong science curriculum at all grade levels. Address the Dropout Crisis: Obama will pass his legislation to provide funding to school districts to invest in intervention strategies in middle school – strategies such as personal academic plans, teaching teams, parent involvement, mentoring, intensive reading and math instruction, and extended learning time. Expand High-Quality Afterschool Opportunities: Obama will double funding for the main federal support for afterschool programs, the 21st Century Learning Centers program, to serve one million more children. Expand Summer Learning Opportunities: Obama’s “STEP UP” plan addresses the achievement gap by supporting summer learning opportunities for disadvantaged children through partnerships between local schools and community organizations. Support College Outreach Programs: Obama supports outreach programs like GEAR UP, TRIO and Upward Bound to encourage more young people from low-income families to consider and prepare for college. Support English Language Learners: Obama supports transitional bilingual education and will help Limited English Proficient students get ahead by holding schools accountable for making sure these students complete school. Recruiting Teachers: Obama will create new Teacher Service Scholarships that will cover four years of undergraduate or two years of graduate teacher education, including high-quality alternative programs for mid-career recruits in exchange for teaching for at least four years in a high-need field or location. Preparing Teachers: Obama will require all schools of education to be accredited. He will also create a voluntary national performance assessment so we can be sure that every new educator is trained and ready to walk into the classroom and start teaching effectively. Obama will also create Teacher Residency Programs that will supply 30,000 exceptionally well-prepared recruits to high-need schools. Retaining Teachers: To support our teachers, Obama’s plan will expand mentoring programs that pair experienced teachers with new recruits. He will also provide incentives to give teachers paid common planning time so they can collaborate to share best practices. Rewarding Teachers: Obama will promote new and innovative ways to increase teacher pay that are developed with teachers, not imposed on them. Districts will be able to design programs that reward accomplished educators who serve as a mentor to new teachers with a salary increase. Districts can reward teachers who work in underserved places like rural areas and inner cities. And if teachers consistently excel in the classroom, that work can be valued and rewarded as well. Higher Education: Create the American Opportunity Tax Credit: Obama will make college affordable for all Americans by creating a new American Opportunity Tax Credit. This universal and fully refundable credit will ensure that the first $4,000 of a college education is completely free for most Americans, and will cover two-thirds the cost of tuition at the average public college or university and make community college tuition completely free for most students. Obama will also ensure that the tax credit is available to families at the time of enrollment by using prior year’s tax data to deliver the credit when tuition is due. Financial Aid: Obama will streamline the financial aid process by eliminating the current federal financial aid application and enabling families to apply simply by checking a box on their tax form, authorizing their tax information to be used, and eliminating the need for a separate application.